Inter-institutional cooperation among physicians becomes increasingly important. Yet, it is unrealistic to assume that cooperation can be supported via a homogeneous system that is pre-installed in every organization. Instead, physicians will typically have their own autonomous systems that support internal processes. Traditional activity-oriented workflow models do not resolve inter-institutional integration challenges. The goal of the proposed solution is to provide information exchange between strict autonomous healthcare institutions, bridging the gap between primary and secondary care, following traditional paper-based working practice. In large-scale inter-institutional scenarios, it is necessary to decouple cooperation functionality from the existing applications. This thesis presents the alpha-Flow approach for distributed process management, which enables ad hoc cooperation via active electronic documents without the need to integrate local systems. The rationale behind separating content, decision support, and coordination work will be explained. 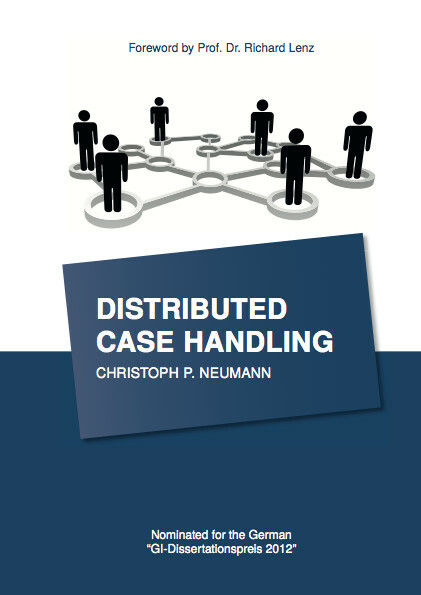 A distributed case file, the alpha-Doc, is used to coordinate cooperating parties. Using this case file does not require any preinstalled system components, so genuine ad hoc information interchange is enabled. The case file contains both the distributed process schema in form of a collective therapy plan as well as arbitrary content documents that are shared among the cooperating parties. To illustrate the approach an inter-institutional use case is provided by cooperative breast-cancer treatment.